Hugh McCulloch twenty dollar blue seals as a type are not especially rare. You could buy a very common one for less than $100. Most people collect them based on which state or bank they are from. Some can be very rare. Most trade in the $100 to $400 range. However, you definitely want to make sure you understand what you have before you sell. 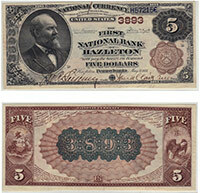 Rare examples can be worth thousands of dollars. Contact us for an exact value. Don't forget to check the serial number. Number 1 notes always sell for nice premiums.